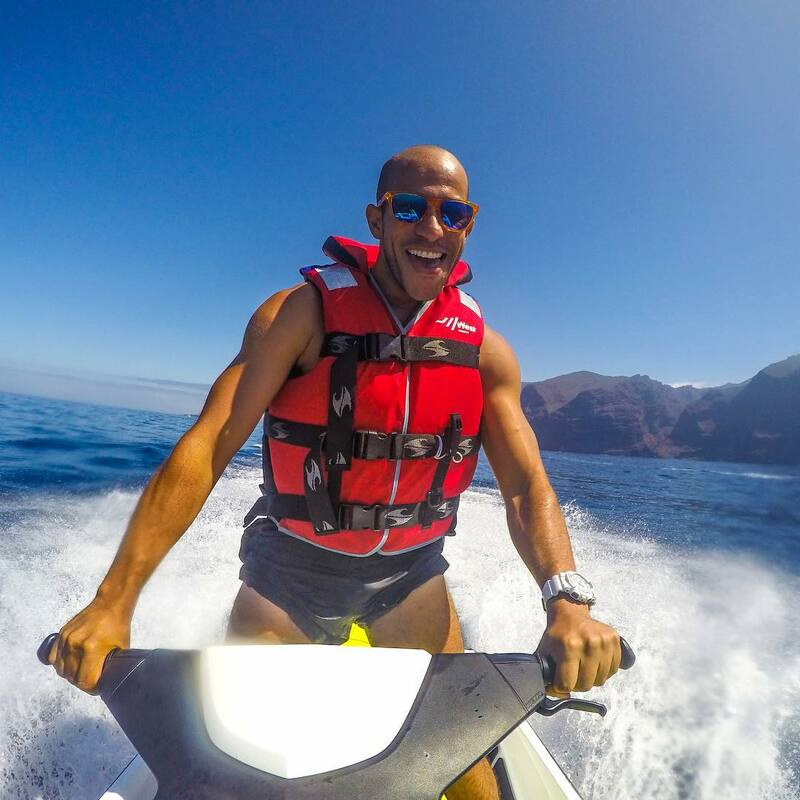 If you’ve ever had the pleasure of a holiday here in Tenerife, then you’ll know already that it’s the ideal destination if you are looking for somewhere to get away from any stresses you have back home. 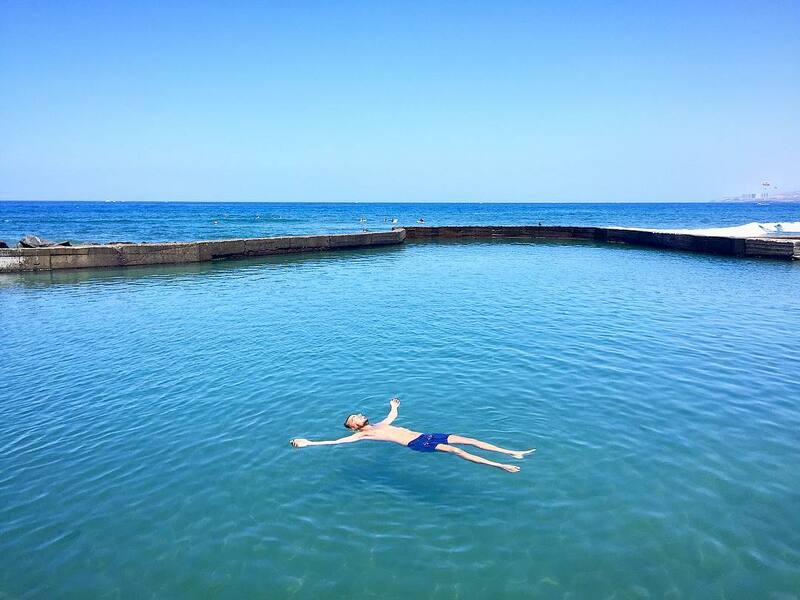 There are beautiful beaches, a calm, tranquil atmosphere and plenty of gorgeous sunshine to soak up. 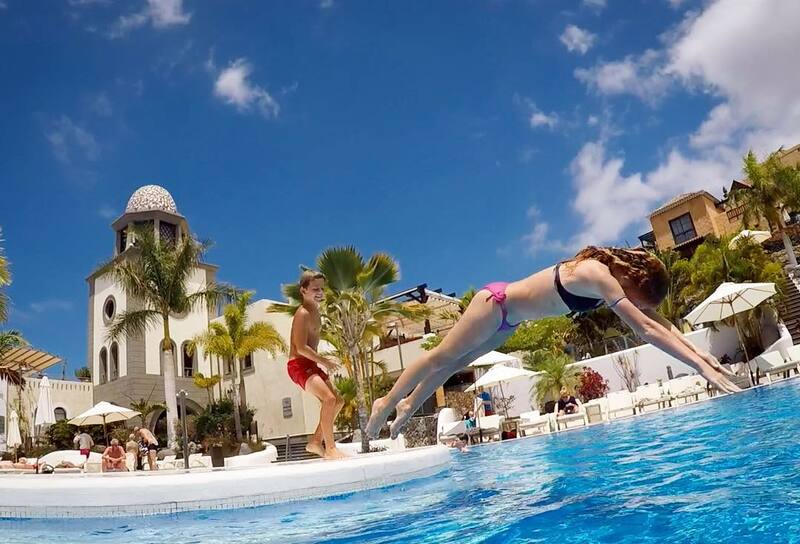 Of course not everyone is looking for that type of super chilled-out holiday though which is why Tenerife is perfect because you really can have it all! You can combine a relaxing holiday lounging by the pool or chilling at the beach topping up your tan, with more energetic activities. For those of you who love a bit of an adrenaline rush, then we have the perfect option for you: paragliding! 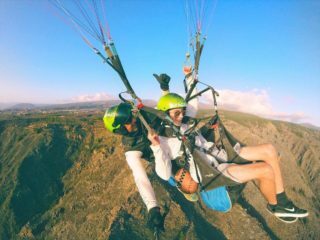 You will absolutely adore a paragliding experience if you’ve ever wondered what it must be like to be a bird gazing down at the ground from high up in the sky. 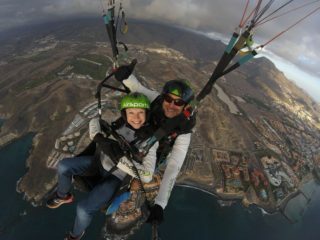 You can experience a bird’s eye view and take in the incredible sights of Tenerife from a totally different perspective. 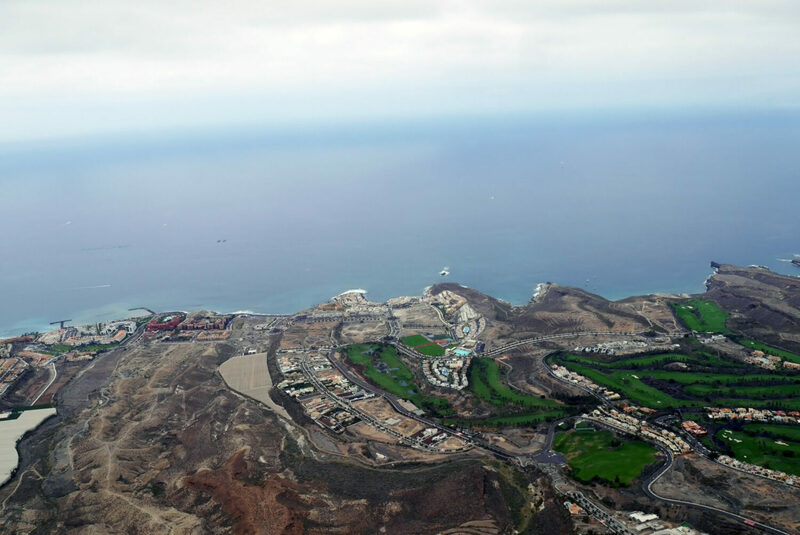 Tenerife is a beautiful island of contrasts, even from normal human eye-level, but to see it from high up in the sky it becomes something truly spectacular. 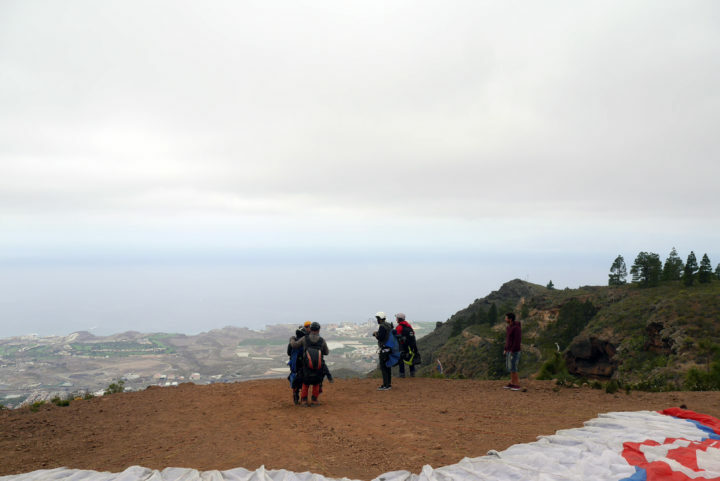 The team at Tenerife Magazine and some friends recently took up the challenge to overcome their fear of heights and try paragliding with the excellent Tenerife Paragliding. We’re not going to lie, we were nervous at first, some of us more than others, because this was the first time for most of us trying paragliding. Some of us had been parasailing before, but this was taking things to a whole new level of excitement. Instead of being strapped to a boat and flying above water which seems relatively tame looking back, we were set to be soaring high above the land. This was certainly not a natural thing for humans to be doing and we would be putting all our trust in the professional abilities of our paragliding pilots. 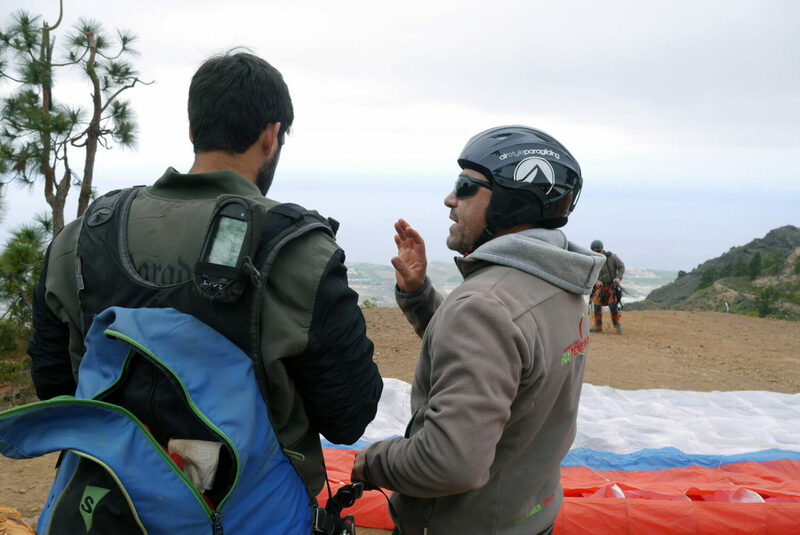 Luckily for us we were in completely safe hands though as each of us were assigned a professional paragliding pilot to fly with, who each had decades of flight experience. 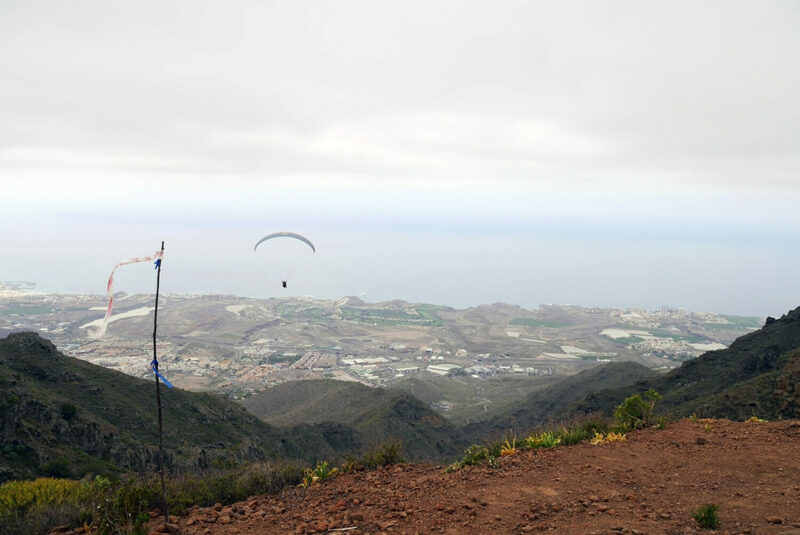 Daniel Crespo had been paragliding for over twenty years and had competed in many competitions; he has even been the champion of Spain, so clearly knew what he was doing. For all of our pilots, their passion and love of flying was obvious right from the start and to them this is so much more than a job. They were getting to do something they love everyday of their lives which is something many can only dream of. We were to find out what all the fuss is about! 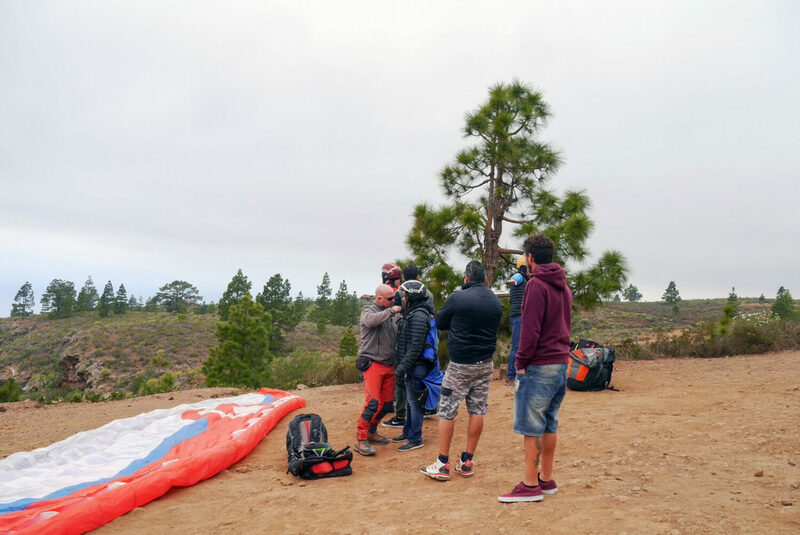 The number one concern of the team at Tenerife Paragliding is their client’s safety and if the conditions are not entirely right, then they will not risk taking you up for a flight, because the right amount of wind is paramount for a successful and most importantly, safe flight. 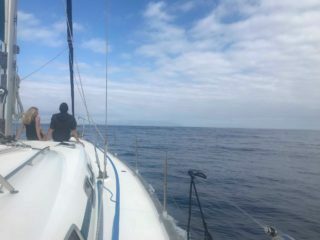 So that you can enjoy the safest and most enjoyable experience possible, the team will simply reschedule your flight for another day if the speed or direction of the wind is not quite right. They are a professional and safety conscious team and will not take any unnecessary risks. The spot where you will be taking off from is high up in the hills and distinctly colder, so we definitely recommend wearing warm clothes. 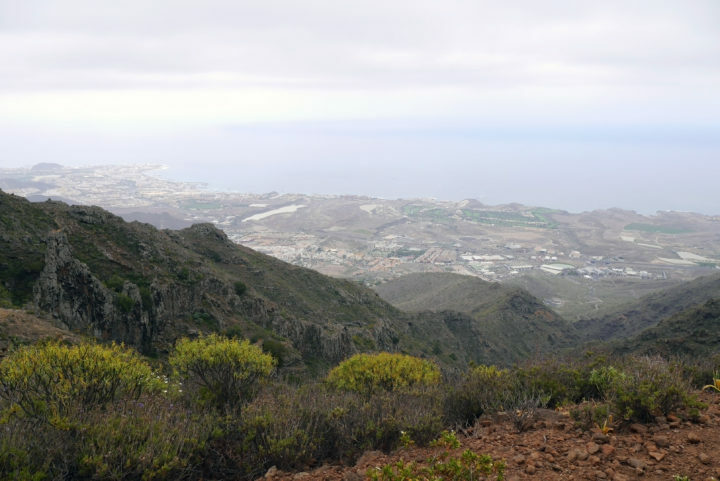 In this part of Tenerife there are pine forests and other vegetation, that will make you feel like you are on a completely different island! Up here you will already notice how amazing the views are out across the island to the coast and ocean in the distance. 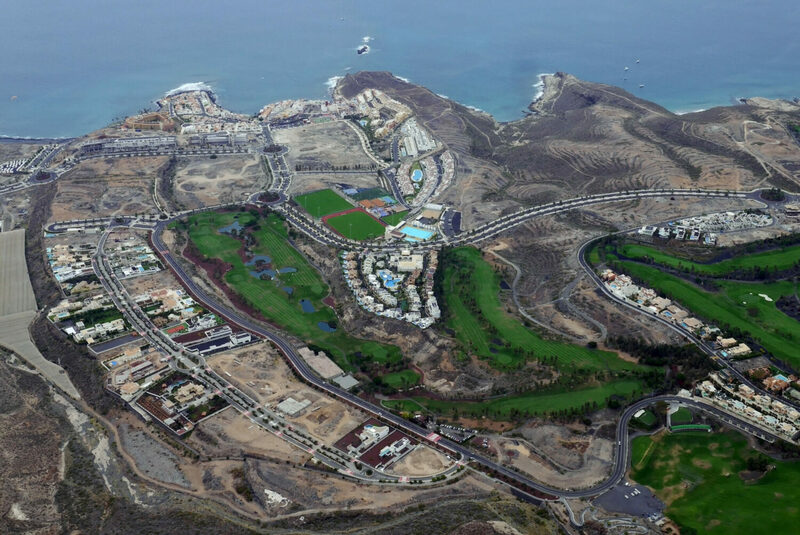 You can see how spectacular Tenerife really is from that height with its amazing volcanic landscape, deep gorges, golf courses, impressive hotels and beautiful beaches. 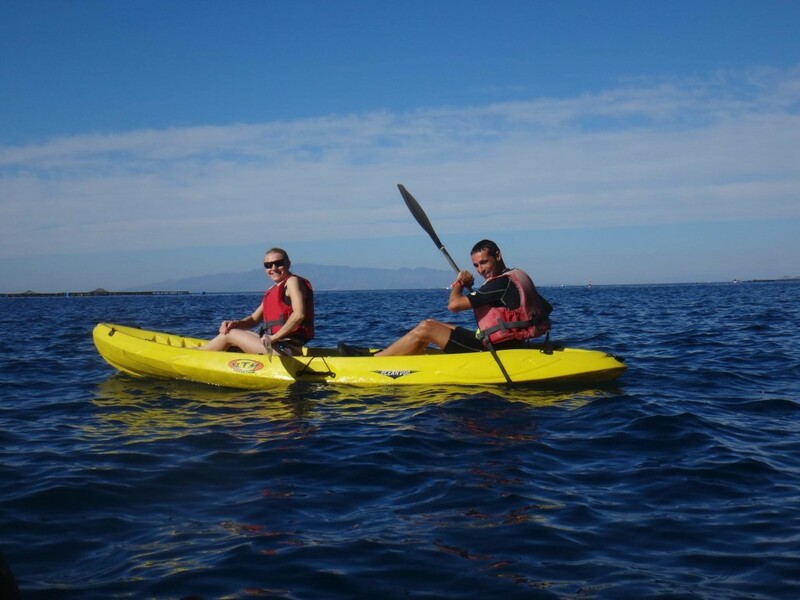 The deep blue ocean sparkles in the distance and you will get a glimpse of La Gomera on the horizon. Even before take-off, this is a stunning sight! Following your arrival at the take-off zone, the team will unpack all of the gear and get everything prepared. This is when everything starts to feel really real. Before it seemed like a kind of abstract thought, but once you see all of the paragliding wings laid out with the harnesses and other equipment you will know it is almost time to be flying above through the air. Following this our individual pilots attached our harnesses to the wings and gave us some clear instructions as to what to expect and how to achieve the best flight experience, one of which is that when it is your time to take-off you have to just keep running to the edge, don’t slow down at the edge of the cliff! We were also handed Go-Pro cameras on selfie-sticks to record the flight. One by one we watched the others run to the edge with their pilot and then up and away they went. Even watching from the ground was spectacular. Then when it is your individual time to go and you are just about to run to edge, it will feel quite surreal. You will quite probably be thinking (as I was), what the hell am I doing here. There is not enough time to think too much though, as once your pilot shouts run then you go without looking back and before you know it, you are soaring through the sky like a bird. Before take-off it seems difficult to believe, but once you are up in the air you can almost totally relax. You can sit back as you are suspended in the harness as your pilot does all of the work. 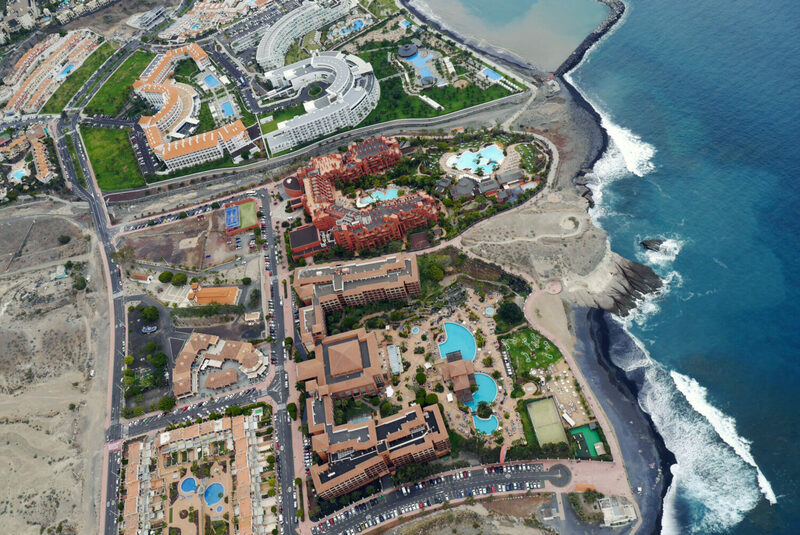 Your nerves will go and you can just take in the incredible sights of Tenerife from the air, while also taking video on the Go-Pro. From the heights you reach everything looks miniature including people, cars, buildings, hotels and even the golf courses and giant gorges. Seeing the people wandering around is like watching tiny ants and must be how birds see the world while they are in flight. You can enjoy a completely panoramic view as everything spans out around you spectacularly, with the land below, the ocean surrounding and La Gomera in the distance. This really is an incredible experience and is likely to be different to anything you’ve ever tried before. It’s also quite the adrenaline rush, with the wind in your hair and nothing but an oversized kite keeping you up in the sky. Don’t worry though as it’s really no-where near as scary as you might think and is actually quite relaxing, as you can sit back and let the pilot take total control, as he navigates you towards your landing spot on the beach. The landing is really fun as you head towards the coast, over the top of hotels where you can see people lounging in pools and eating meals. You head out to the ocean and then your pilot will navigate you back towards the beach where you will land right next to a beach bar with onlookers staring in amazement. After you land you can even enjoy a quick drink yourself. 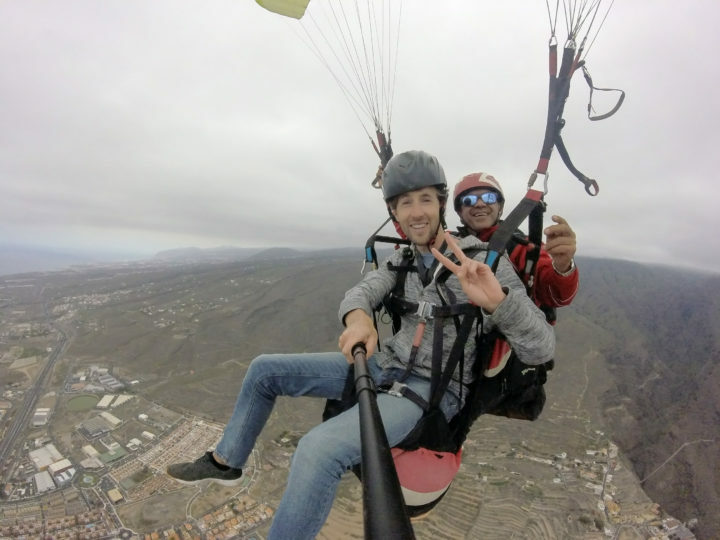 If you are looking for something completely out of the ordinary and incredibly memorable on your next trip to Tenerife, then you should definitely try paragliding with Tenerife Paragliding. Even if you have a lot of nerves beforehand like some of our group did, you will feel amazing afterwards and buzzing with energy. 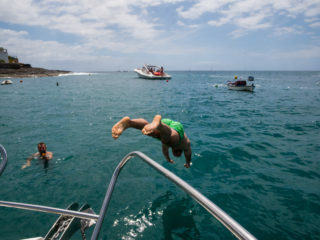 Any holiday in Tenerife is awesome even if you just want a relaxing holiday by the pool or at the beach, but if you’re looking for that once in a life-time experience to amaze all your friends and family with, then this is definitely the excursion for you!